Capt. Jim Neiger of "Flight School Photography" and Capt. James Shadle of "In the Field Workshops" are proud to present the "Best of Florida" workshop series – the best time of year, the best weather, the best species, the best colors, the best group size and the best instruction of its kind. For the first time, a single workshop experience will combine two of Florida's most desirable locations. 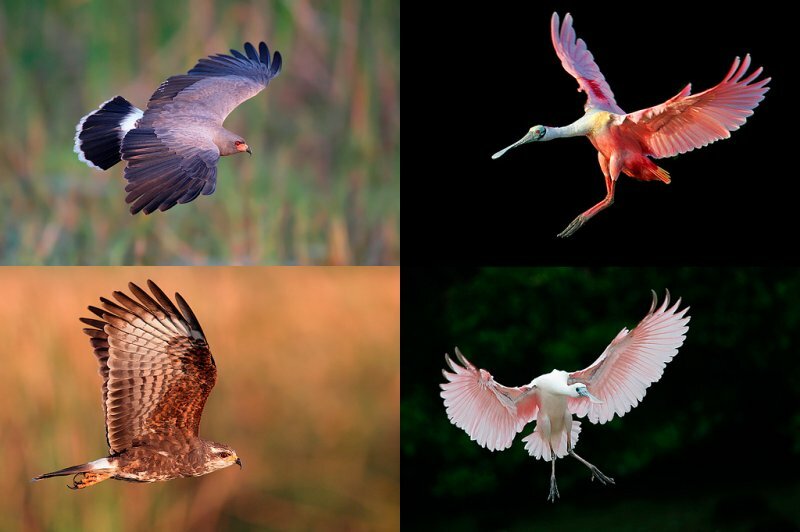 The workshops will include the best of central and west central Florida's nature photography experiences. And to make sure your experience is second to none, the "Best of Florida" workshops will be led by instructors' with unparalleled knowledge of the locations and the subjects found there. The photography sessions by boat will be held on the unspoiled and unparalleled Lake Blue Cypress. This spectacularly beautiful lake is virtually free of civilization and manmade elements. The lake is surrounded by ancient cypress swamp and marshy wetlands. Here, the gorgeous cypress trees grow from the lake bottom, surrounded on all sides by water. Osprey nest by the hundreds in these trees, and participants will be able to photograph them as the fly to and fro, dive for fish, gather nesting materials, and feed their young chicks. Some of the nests are actually at or below eye level when standing in the boat. The only distraction in this pristine, wilderness environment is the constant cries of the Osprey as they frolic in the air and defend their nests from other birds. Lake Blue Cypress is also a landscape photographers dream. The horizons contain nothing of man's influence and only the beauty of the real Florida wilderness. Perches and backgrounds are spectacular beyond belief. April and May are the best months to be at Lake Blue Cypress. Many of the birds are actively nesting and rearing their young during this time. Wildflowers cover the stumps and trees like blankets of radiant color. The skies glow with spectacular, multi-hued sunrises and sunsets. 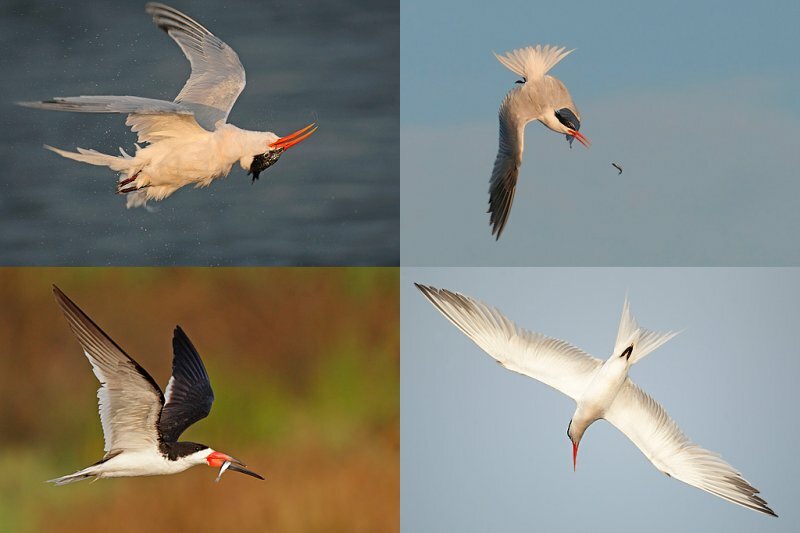 Hundreds of different species of birds are possible including the typical Florida waders and water fowl. Large Alligators are commonly seen sunning themselves on top of the fallen trees and stumps amidst the colorful wildflowers. The biggest problem for a photographer here is deciding which subject to photograph. Even the weather cooperates this time of year. It is the dry season and clear, sunny days are the most common weather condition. 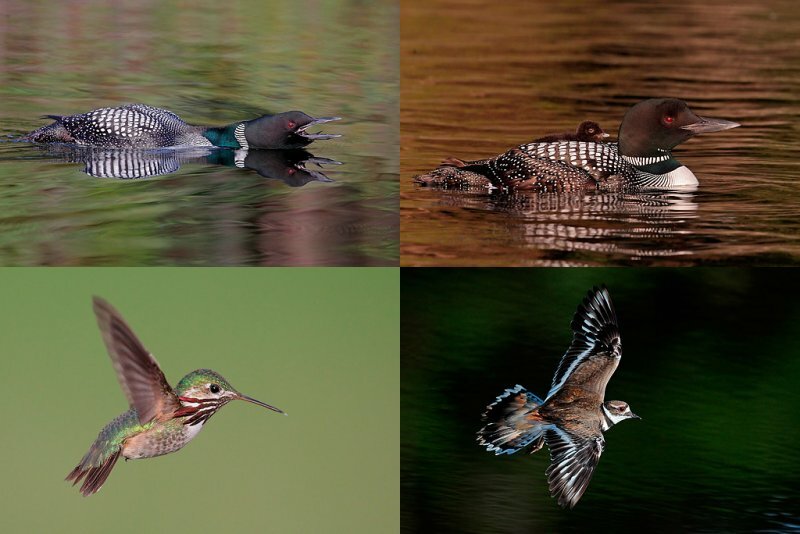 Join expert bird photographers Jim Neiger and Kevin Karlson for 5 days of extraordinary bird photography and instruction at beautiful Lac Le Jeune. This beautiful lodge set in the mountains near Kamloops, British Columbia offers unique opportunities to photograph Common Loons with their chicks, as well as a wide assortment of other avian subjects around the lodge and surrounding areas. A number of other photogenic bird species nest around the lodge, including Black Tern, Barrow's Goldeneye, Ring-necked Duck, Red-naped Sapsucker and many others. Nearby wildlife refuges and recreation areas have several pairs of very photographable Red-necked Grebes with chicks in the nest and riding on the parent’s back. Mountain Bluebirds may be found in nest boxes along numerous country roads. Calliope and Rufous Hummingbirds are possible at several hummingbird feeders. 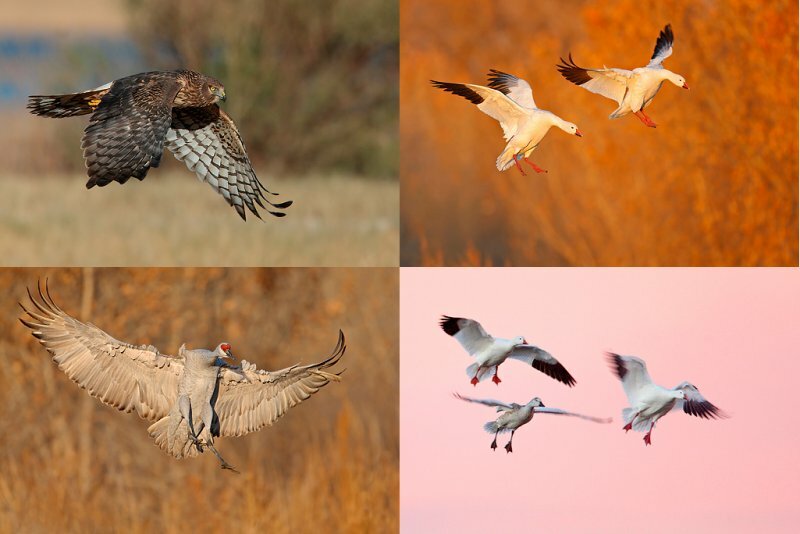 With thousands of migratory birds in flight daily at Bosque Del Apache, what better site for Flight School Photography workshops? 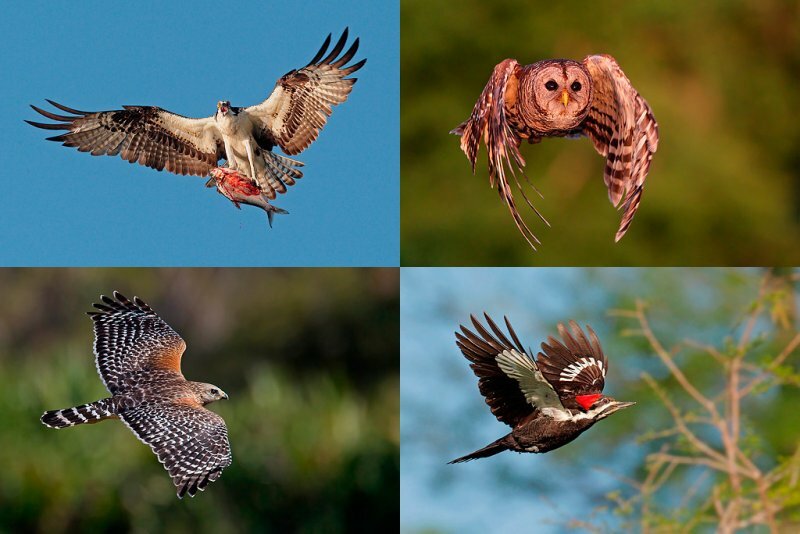 Previous year's workshops were a huge success, so once again, Flight School Photography returns to Bosque. We are anticipating improved conditions and even more outstanding photographic opportunities than last year. The workshops will be held in November, before the Festival of the Cranes and Thanksgiving, which provides important advantages. First, the spectacular fall colors at Bosque are not to be missed and going early will provide that opportunity. The fall foliage offers incredibly beautiful backgrounds for your photos, and adds even more majesty to the already spectacular sunrises and sunsets. Second, going early means there will be less of a crowd, offering more opportunities for "front-row seats" and leisurely days in the field. BOSQUE del APACHE 2011 IPT: "The Complete Bosque Experience." NOV 19-25, 2011. Slide program on the evening of Friday, NOV 18. 7-FULL DAYS: $3299. (Non-refundable deposit: $500; see details below.) Limit: 10/Openings: 6. Co-leaders: Robert O’Toole & Jim Heupel. Geese, cranes, ducks, sunrises, sunsets, and blast-offs. Live, eat, and breathe photography with one of (if not the) world’s premier photographic educators at one of his very favorite locations on the planet. Plus great co-leaders and top-notch Photoshop instruction. Please see terms and deposit info below. With my ever-shrinking teaching schedule and all the specialty trips sold out, this trip may well represent a rare opportunity to learn from the best, so do not wait too long before sending your deposit. Clemens van der Werf who was on this year’s Bosque trip is already registered for next year. If you missed the Photographer Experience Quiz and the Mystery Photographer & Experience Level Revealed! posts on the blog, you will surely want to check them out to see what Clemens has accomplished in less than a single year of bird photography. And how! GREECE/DALMATIAN PELICAN EXPLORATORY IPT. FEB 27-MAR 5, 2011. 6 1/2+ Full Days of Photography: $2499. (Limit: 6/Sold Out). Co-leaders: Arthur Morris, Robert O’Toole, and Yannis Arvanitis as our bi-lingual guide. Payment in full is due immediately. Please call to hold a spot pending the arrival of your check made out to “Arthur Morris.” Europeans please e-mail for wire transfer details. No discounts. For images and complete information click here. If you would like additional info on Lake Kerkini please e-mail me at samandmayasgrandpa@att.net and request same. Please see terms and deposit info below. Note: Arthur Morris has been a paid Canon contract photographer, part of the Explorers of Light program, since 1996 and continues in that role today. Hunt's Photo of Boston, MA is a BAA sponsor as is Delkin Devices. Back issues of all BAA Bulletins can be found in the Bulletin Archives that may be accessed here: http://www.birdsasart.com/bn.html.